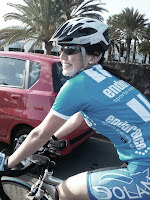 Saturday 28th January 2012: -3 degrees in the UK, 22 degrees in Lanzarote, the Bath University Triathlon team start the journey from Bath to Puelto Del Carmen, Lanzarote - The Canary Islands. Although Club le Santa is the notorious training base for athletes in Lanzarote, Bath Uni have found that Puelto Del Carmen offers great apartments, is close to the sea for the swimming, great food (and bars!) and offers a really friendly atmosphere. However for the whole week, we kept our eyes peeled for the Brownlee brothers...who had tweeted they were out in Lanzarote the same week as us! 7.00am morning one and the team gathers in wetsuits with caps and goggles in hand ready to head down to the beach for an hours swimming session. The bay we swam at was 200m from the Islands airport - Arricefe. So as we were swimming, numerous aeroplanes would fly overhead, wheels down and ready to land, an incredibly sight. Only one of our swims that week were we interrupted. By a swarm of 30-40 jellyfish. Only little ones, but just as terrifying! Five of us were stranded about 200m from shore, skulling for at least 20minutes (felt like days) disucssing tactics, debating the options (limited) available to us and frantically checking our watches, to find that the lifeguard did not in fact come on duty for another 45minutes. Disaster. Four stings between us, much girly squealing and 30minutes later, we decided that our only option was to swim the 200m back to shore - at 100% effort following each others bubbles to safety. Not surprisingly, the remaining swims that week were carried out in the shallowest water possible, with wetsuit arms pulled over hands, and neck cramp from looking ahead rather than down in the water. The intention of spending a week in Lanzarote is to spend as much time on the bike as physically possible - away from the snow, ice and cold of Britain's winter months. With almost 400km racked up in 7 days - safe to say, I think I made the most of the sunshine and clear roads. So generally the days were spent with an early morning sea swim, a good few hours on the bike - racking up the miles! Often the rides would be arrange with a meeting point mid way for lunch, at a restaurant located on top of a hill (mountain?! ), serving paella and cake to the hungry cyclists who reached the top. The restaurants 360 degree windows, overlooking the most staggering views over the island and far out to sea. An excellent location for our team photo. The evenings were spent experiencing the local bars, playing cards, Irish snap and other various student games. Spoons was a classic - high concentration levels required and potentially lethal. The majority of us were dead on our feet by 7pm, but were strictly awoken when the clubs social secretary decided bars, pool or cards would take place that evening. We also visited a couple of restaurants, though the all you can eat for 7Euros Chinese buffet was a clear winner with a bunch of triathletes burning thousands of calories each day. The last few hours in sunny Lanza were spent waiting for our airport transfer - we our high spirits were rapidly knocked by SKY News - "Breaking News - Severe weather warnings and deep snow in the UK"
Arrived back in snowy, icy and slushy Bath at 2.30am wearing no more than flip flops, shorts and team hoody. What an AMAZING week. The outdoor climate that allows you to eat/train/LIVE outside from 7am - 11pm in the winter (some serious immigration decisions to be made). All in all an absolute MUST for any keen triathlete. Incredible.